The development of olive oils found with the Sierra de Cádiz Designation of Origin exclusively use the following varieties of olives: lechín de sevilla (the main one), manzanilla, verdial de Huevar, verdial de Cádiz, hojiblanca, picual, alameña de Montilla and arbequina. 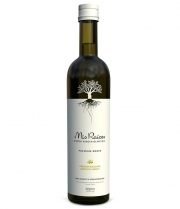 With a medium to intense fruitiness from green or ripe olives, it reminds us of wild fruits and smells with a slightly bitter and spicy flavour that can be tasted on the palate. The production area that is protected by the Sierra de Cádiz Designation of Origin consists of Setenil de las Bodegas, Alcalá del Valle, Torrealhaquime, Algodonales, Olvera, El Gastor, Zahara de la Sierra, all in the province of Cádiz and Coripe and Pruna in the province of Seville.